Jurgen Klopp earned his first win as Liverpool boss after Nathaniel Clyne's maiden Reds goal saw off Bournemouth in the Capital One Cup fourth round. Reds keeper Adam Bogdan stopped Junior Stanislas's close-range shot with his legs as Bournemouth started brightly. Liverpool, who drew their three opening games under Klopp, led when Clyne pounced after Adam Smith cleared Joao Carlos Teixeira's flick off the line. Bogdan saved from Matt Ritchie in injury time as Liverpool held on. The Reds, who have won the League Cup on a record eight occasions, move into the quarter-finals for the second successive season. Klopp will take his team to Premier League rivals Southampton in the last eight. Liverpool's attack has been severely depleted by injury, with Christian Benteke joining Daniel Sturridge on the sidelines after being ruled out of the tie on Wednesday morning. Their absence, both through knee injuries, meant Klopp placed his faith in £29m summer signing Roberto Firmino and 20-year-old Belgium international Divock Origi. Ex-Dortmund boss Klopp said Firmino was "the best player in the Bundesliga" for a short time last season - and the Brazil international responded with a standout performance against the Cherries. Firmino's vision created the winning goal, picking out Teixeira whose cheeky backheel could only be cleared into the path of Clyne. And former Lille striker Origi, who is yet to score for the Reds since arriving at Anfield this season following a loan year in France, can also take credit for his part in the winner. He had few opportunities to break his scoring duck, but his pace pulled apart the Cherries defence, allowing Firmino to pick out Teixeira. Bournemouth had conceded 10 goals in their previous two Premier League matches, and Cherries boss Eddie Howe had warned his side they must defend better at Anfield. Howe made six changes to the team that started Sunday's 5-1 home defeat by Spurs - and admitted only several injuries and the unavailability of loan players stopped him making more. On the whole, they were much tighter defensively, and while Liverpool created the better opportunities, the visitors were rarely cut open easily. Teixeira's curling free-kick had to be pushed clear by keeper Adam Federici after the break, while Firmino dragged a shot wide after Cherries midfielder Marc Pugh lost possession. On the other hand, once Bogdan had made three smart first-half saves from Stanislas, Eddie Howe's men offered little attacking threat themselves. "My first win feels better than a draw. I'm really satisfied because this team had never played together and the young players did really well. "We had many chances against a side which played with nearly their first team. We were dominant, played football and got the win we deserved. "It was very important to win because we decided to go with a new team. To win is always good for the feeling of the whole team." "I think we should have got something from the game. We created some good chances in both halves, but especially in the first half we had that cutting edge and their keeper made some good saves. Offside, Bournemouth. Lee Tomlin tries a through ball, but Simon Francis is caught offside. Corner, Bournemouth. Conceded by Adam Bogdan. Attempt saved. Matt Ritchie (Bournemouth) right footed shot from the right side of the box is saved in the bottom right corner. Assisted by Adam Smith. Attempt missed. Tokelo Rantie (Bournemouth) left footed shot from outside the box is too high. Hand ball by Lucas Leiva (Liverpool). Shaun MacDonald (Bournemouth) wins a free kick in the defensive half. Attempt missed. Joshua King (Bournemouth) with an attempt from the centre of the box misses to the right. Assisted by Charlie Daniels with a cross following a set piece situation. Substitution, Bournemouth. Tokelo Rantie replaces Junior Stanislas. Attempt missed. Connor Randall (Liverpool) right footed shot from outside the box misses to the left following a corner. Corner, Liverpool. Conceded by Adam Federici. Attempt saved. João Teixeira (Liverpool) right footed shot from outside the box is saved in the top right corner. Shaun MacDonald (Bournemouth) is shown the yellow card for a bad foul. Attempt blocked. 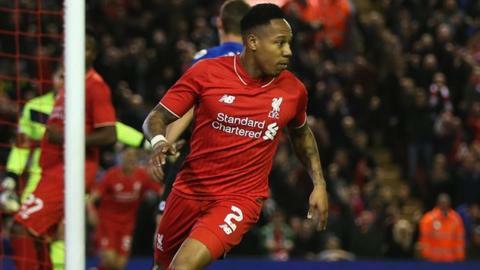 Nathaniel Clyne (Liverpool) right footed shot from outside the box is blocked. Assisted by Divock Origi. Attempt saved. Lucas Leiva (Liverpool) right footed shot from outside the box is saved in the top centre of the goal. Corner, Liverpool. Conceded by Simon Francis. Substitution, Bournemouth. Joshua King replaces Harry Arter. Substitution, Bournemouth. Lee Tomlin replaces Yann Kermorgant. Substitution, Liverpool. Lucas Leiva replaces Cameron Brannagan. Attempt missed. Roberto Firmino (Liverpool) right footed shot from a difficult angle on the right misses to the right. Attempt blocked. Jordon Ibe (Liverpool) left footed shot from outside the box is blocked. Assisted by Roberto Firmino. Joe Allen (Liverpool) is shown the yellow card for a bad foul. Attempt blocked. Harry Arter (Bournemouth) left footed shot from outside the box is blocked. Assisted by Matt Ritchie. Attempt missed. Roberto Firmino (Liverpool) right footed shot from the right side of the box is close, but misses to the left. Corner, Liverpool. Conceded by Adam Smith. Attempt missed. Shaun MacDonald (Bournemouth) header from the centre of the box is close, but misses to the left. Assisted by Junior Stanislas with a cross following a corner.